This abrasion protection spiral wrap is simply wrapped over hydraulic hose, pneumatic lines, wires or cable to provide tough protection for abrasion and wear protection. 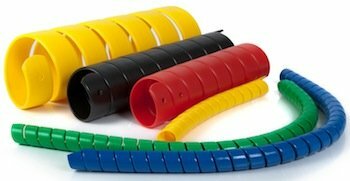 Available in sizes to wrap individual or bundled hoses and cables with a total ID of between 0.4" through 5 inches. 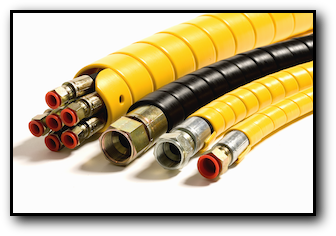 SafeEdgeTM helps to organize and bundle hoses and cables, while proving heat resistance to a maximum of 175°F continuous duty, and provides excellent abrasion, scuff and wear protection and resistance Also useable to -60F. Used to protect brake air lines, fuel lines, hydraulic lines on mobile hydraulic equipment.